Buy Granovita Gourmet Pate - Tofu, Tomato & Peppers 125g in the UK from our online shop or directly from our independent Scottish store. A delicious gourmet vegetarian organic tofu pate made with organic tomatoes and organic peppers. Tofu* (24%) (Soyabeans*, water, gelling agent: nigari (magnesium chloride)), non-hydrogenated palm fat*+, tomato puree* (15%), water, red pepper* (10%), onions, potato powder*, emulsifier: soy lecithin, soy flour*, non-hydrogenated sunflower oil*, tomato paste* (2%), sea salt, dehydrated onion*, apple vinegar*, black pepper*, paprika*, garlic*, cayenne pepper*. Where can you buy real Granovita Tomato Pate safely online? 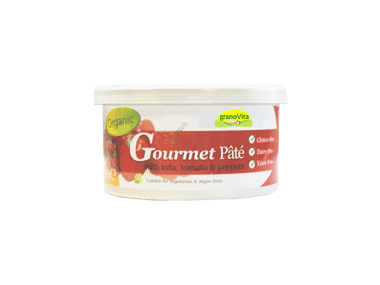 If you are wondering where you can buy Granovita Gourmet Pate - Tofu, Tomato & Peppers 125g safely online in the UK, then shop with us. Granovita Tomato Pate - Granovita Gourmet Pate - Tofu, Tomato & Peppers 125g in Vegetarian Pate and Honeys, Jams & Spreads.